My large field of view setup consisted in a Nikon D810 with the Nikon 105mm f/1.4 lens used at full aperture. This unusual setup was chosen in order to be able to collect as much light as possible during the eclipse to get the best signal to noise ratio. The short exposure time imposed by the fast f/1.4 aperture and the short focal length allowed to use a simple tripod without tracking. Altogether, more than 120 images were acquired during the totality, resulting in a 100 seconds of cumulative exposure. 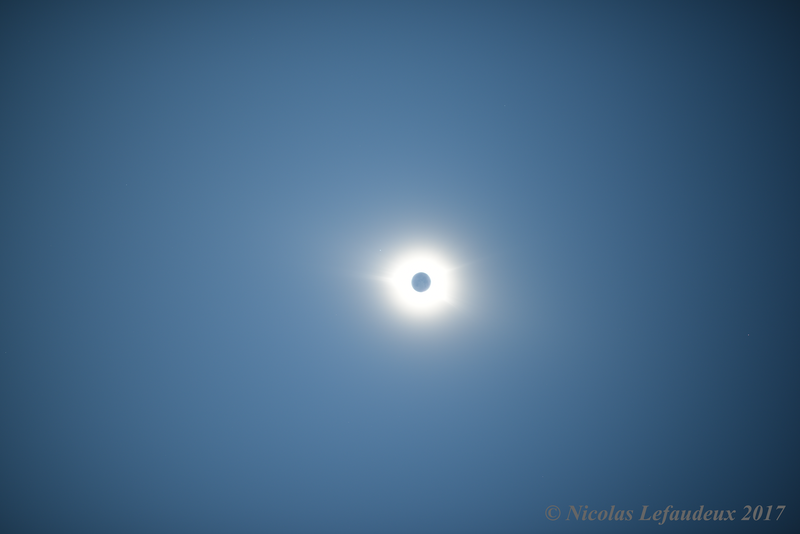 The main difficulty in the processing of such image is the subtraction of the blue sky background which is much stronger than the outer corona. 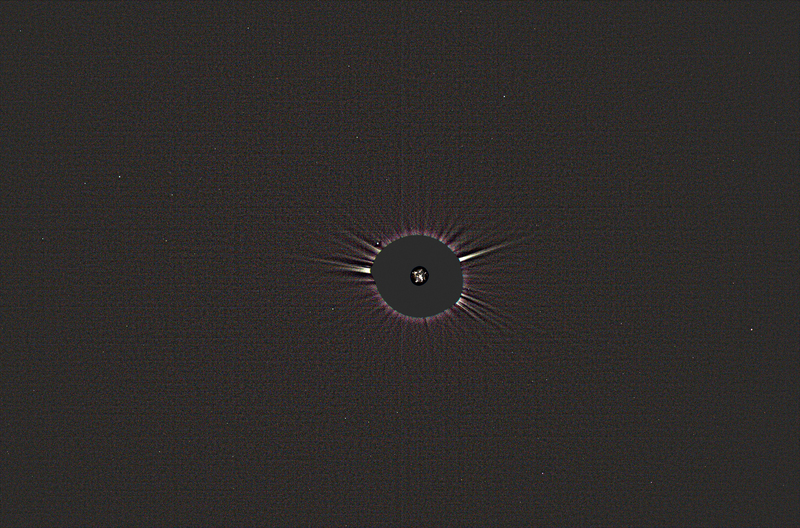 On the final image, the solar corona is visible as far as 30 solar radii is visible. At this distance, the solar corona is clearly elongated along the direction of the ecliptic. Magnitude 11 stars are visible, resulting in hundreds of stars over the whole image. This image was awarded the first place of the Sun category of the 2018 Insight Astrononomy Photographer of the year contest. Large field of view composite image of the 2017 total solar eclipse: the image is a composite of more than 120 individual images acquired with a Nikon 105mm f/1.4 lens used at full aperture for the highest collection of photons (high res here). 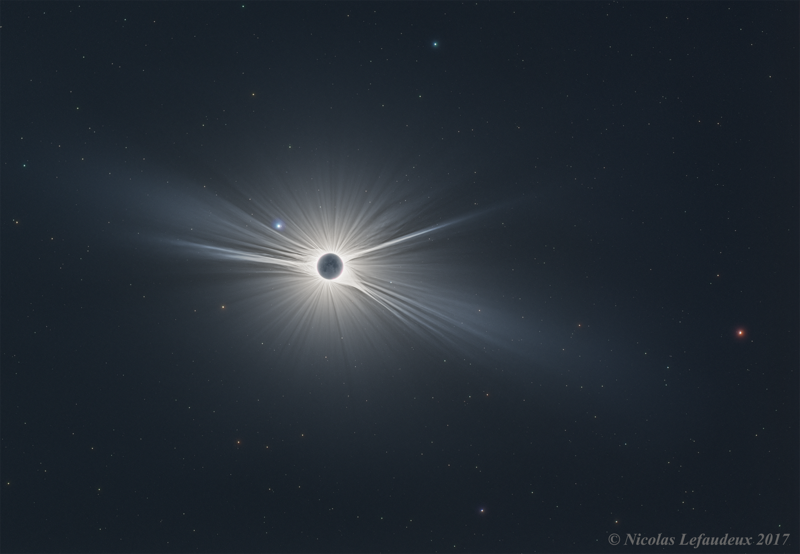 The solar corona reaches an extend of ~30 solar radii, ie around 15°, and hundreds of background stars down to magnitude 11 are visible. 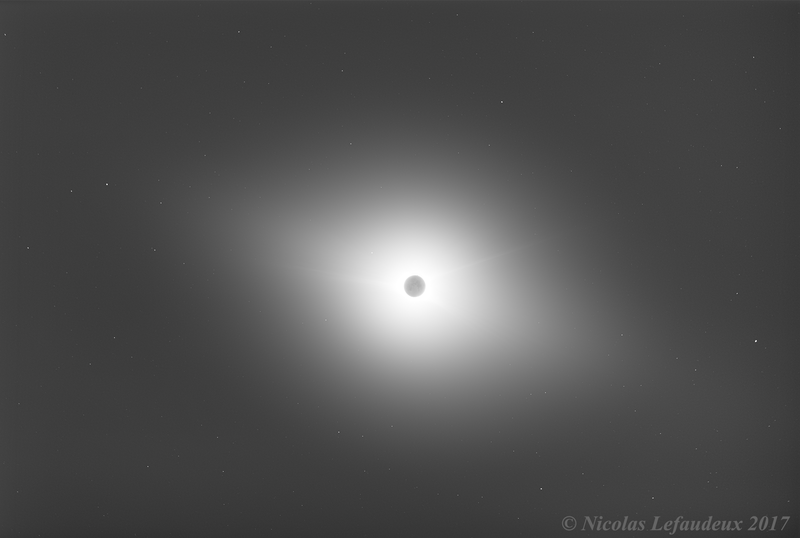 Black and white image before enhancement showing the full extend of the solar corona (high res here) going as far as ~30 solar radii, and hundreds of background stars down to magnitude 11. A single raw exposure (high res here): the Earthshine is clearly visible as well as Regulus, Mars (on the right edge), and many individual stars. A single, uncalibrated raw exposure after background subtraction (high res here) shows stars down to magnitude ~8.5. Calibrating and stacking all the 120+ images acquired allows to reveal stars down to magnitude ~11.